A gourmet tasting tour 4 nights and 5 days. 2 night stay at the new Macq 01 Hotel in Salamanca + 2 night stay at Adventure Bay Retreat on beautiful Bruny Island. A two night and three day tasting tour of beautiful Bruny Island. Staying at Adventure Bay Retreat, Bruny Island. 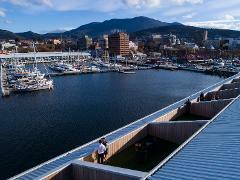 A two night and three day tasting tour of beautiful Hobart. Staying at the new Macq 01 Hotel on the waterfront at Salamanca.